Most of us who spend a large part of their time browsing the internet are worried for the security of their data and their online privacy. Google is also concerned about the security of your account and your data and therefore working continuously improving their safety. This safer internet day it introduced new updates that are meant to increase the level of safety users enjoy while surfing online. It also released some directions on its blog users can follow to have a safer experience online. Many of you may already be familiar with most of these features but it’s still good to remind yourself and review your security features from time to time. Apart from building security into its own products, for the automatic protection of the information in your account, Google also shares best practices with other organisations to make browsing a safer experience. The security tips Google has shared are simple to follow. As per a survey that Google conducted with Harris Poll showed that there are many people who are not familiar with these issues. However, there are five simple things to do to make online browsing experience safer. Your security risk increases when you use the same password for all accounts. However, a very large number of users still do and use the same password for multiple accounts. It’s just like using the same key for everything and if someone can gain access to the key he can open every lock and unlock all your valuables. The safety of all your accounts is compromised when someone gains access to the password. The risk can be eliminated by using unique and hard to guess passwords. Having at least eight characters long password is a good practice. However, a large number of people, around 60 percent of those surveyed find it very difficult to remember several passwords. The problem can be solved through the use of password manager built into chrome. Apart from that users can keep track of their passwords by noting them down using pen and paper. Hackers can access your passwords online but not if you have stored them physically near you. You should keep your passwords in a safe place if you note them down. Keeping your software updated is also a method to make your browsing experience secure. Ensure that you always keep the latest version of software running on your computer or your mobile device. The Harris Poll showed that while 79% people were aware of the importance of updating software, around one third were either unsure or did not update regularly. Whether you are using Windows or Mac on your computer and iOS or Android on your phone, you must never forget to update them. You need not worry about Chrome since it will auto update. In case of the other services too you should update them right away after receiving the notifications. Users must set up Two Factor Authentication (2FA) or Two-step verification to block unauthorized access to their account. Google’s automatic and risk based authentication are generally more than sufficient for most people but 2FA offers an extra layer of protection. However, the survey showed that around a third participants did not use 2FA or were unaware of they were using it or not. 2FA uses a second verification apart from login and password like a SMS, an app generated key or a prompt received on a trusted device or a physical security key. Just visit this link to set up 2FA. 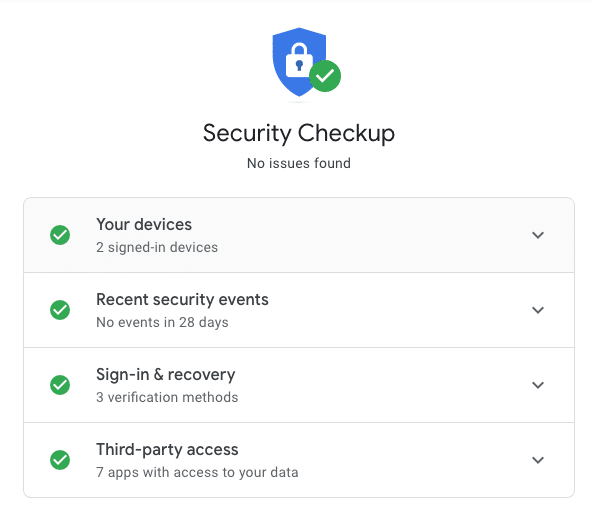 Google has designed a small security check up that can help you strengthen the security of your a Google account by offering you personalized recommendations. The security check does not take even 2 minutes. Taking the security check keeps you safe while working on Google and also offers you tips that make your overall web experience much safer. Google can offer tips like applying screen lock on your mobile phone or removing risky third party apps and sites that might have access to your phone account. These security tips are simple and easy to follow. For more such tips you can visit Google’s safety center or the security section in your Google account.